Jollibee celebrates Sarah Geronimo's #8700 Facebook Live Performance on June 22 at 55 Events Place, Quezon City. The event was hosted by Gelli Victor and attended by Sarah's popsters and media. The trendsetting duo invited fans to a-no-holds barred gathering that gave attendees the chance to learn the hottest moves from the #87000 TVC from Pop Star Royalty herself, Sarah Geronimo. Jollibee expanded the full production of the commercial for its nationwide express delivery hotline with a Facebook live broadcast that offers unlimited access to the line-up of activities happening inside 55 Events Place, Quezon City. Fans who tuned in were able to catch Sarah G. having fun with her loyal Popsters, and even peek into her personal Jollibee favorites and next career moments. The audiences at home also got to participate through their screens, suggesting the next challenges for the celebrity and urging her on with their comments and reactions on social media. 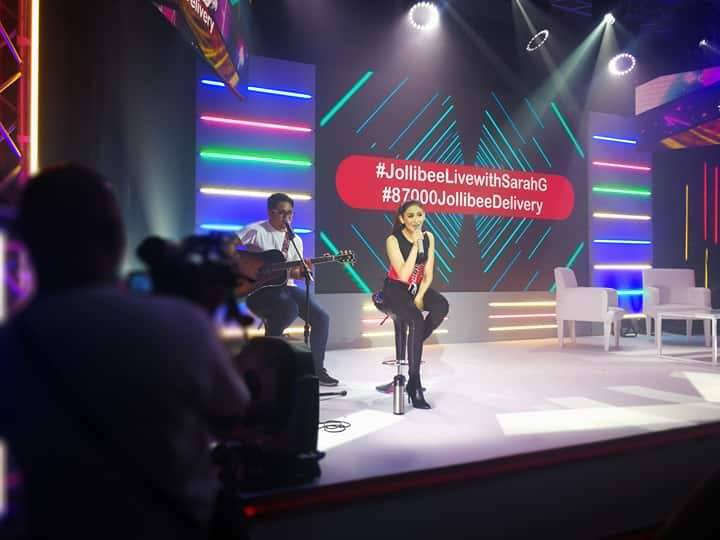 Sarah was fully on-board to deliver a great time for everyone, even taking on the dare To help one of her fans call Jollibee’s #87000 hotline and have everyone’s favorites delivered right there, on the stage. The sets of audiences waited as the fastfood chain’s delivery staff walked up to the Sarah to handover the bags of langhap-sarap treats to the star of the commercial. Joy filled the room as the charming star received her order and welcomed the delivery crew with bags of Jollibee on hand for the audience. “Don’t forget the hashtag!” Sarah jovially reminds her audience. 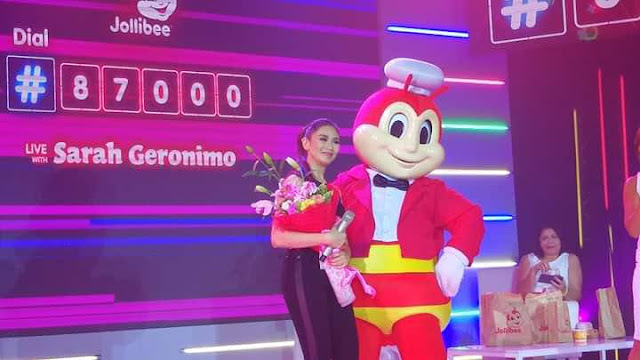 The ever-grateful celebrity proceeded to thanking her audience and Jollibee, her partner for her onstage and Facebook live comeback. Recreate the scenes to the hashtag-worthy event by watching it on www.facebook.com/JollibeePhilippines/ and dialing in Jollibee favorites through #87000, its nationwide express delivery hotline.